A group of Anglican nuns from the Community of St Mary the Virgin (CSMV) in Wantage, Oxfordshire, are to be received into the full communion of the Catholic Church in January 2013. The eleven CSMV sisters, will be joined by Sister Carolyne Joseph, formerly of the Society of St Margaret in Walsingham, who joined the Ordinariate in January 2011. 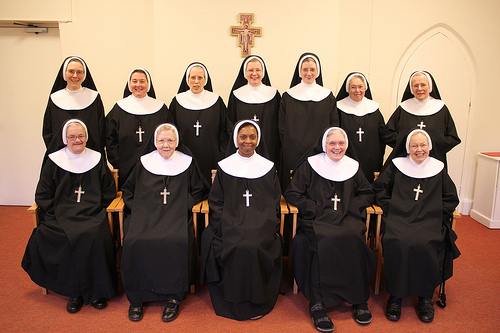 These twelve sisters will initially be established as a Public Association of the Faithful within the Personal Ordinariate. They will be known as the Sisters of the Blessed Virgin Mary and will continue in their work of prayer and contemplation, whilst retaining certain of their Anglican traditions and practices. Foremost amongst these is the tradition of English plainchant for which these sisters are well known. After consultation with Church of England authorities it has been decided that the sisters will move from their convent in Wantage and, after reception into the Catholic Church, will spend a period of time with an established Catholic community. Following this, the newly established Ordinariate community will seek to find a suitable new home. Monsignor Keith Newton, the Ordinary of the Personal Ordinariate of Our Lady of Walsingham, said, “The Community of St Mary the Virgin in Wantage has been at the heart of the Church of England’s Religious Life since the mid-nineteenth century. The contribution of the community to the life of the Anglican Communion has been significant, not least through the community’s care for those marginalised by society in Britain, and also in India and South Africa”. Speaking of the decision of the sisters to enter the Personal Ordinariate, Mgr Newton continued, “Those formed in the tradition of the Oxford Movement cannot help but be moved to respond to Pope Benedict’s generous invitation to Anglicans. The sisters have always prayed for the unity of Christians with the See of Peter, now this is to become a reality for them by means of the Ordinariate. We are truly grateful for their faith, courage, and resolve”. The community has been in discernment about the way forward since the publication of the Apostolic Constitution Anglicanorum coetibus in 2009. Mother Winsome CSMV, the Superior of the Community, said, “We believe that the Holy Father’s offer is a prophetic gesture which brings to a happy conclusion the prayers of generations of Anglicans and Catholics who have sought a way forward for Christian unity. The future of our community is a fulfilment of its origins, and as part of the Personal Ordinariate of Our Lady of Walsingham we will continue with many of our customs and traditions, whilst also seeking to grow in Christ through our relationship with the wider Church”. One sister, who was ordained in the Church of England and is now to be received as a Catholic, said, “The call to Christian unity must always be the primary motivating factor in the decision of Anglicans to enter the Catholic Church. Anything which impedes that process cannot be of God, and so must be set aside to achieve this aim, which is the will of Christ”. Those members of the community who will remain in the Church of England have expressed their admiration and respect for those who have taken this decision. In a short statement they said, “Whilst remaining committed to their Religious vows in the Church of England the sisters of the Community of St Mary the Virgin wish the sisters joining the Ordinariate every blessing on their new life in the Catholic Church, and respect the integrity of their sense of call”. The Community of St Mary the Virgin was founded by the Reverend William John Butler and Mother Harriet CSMV as one of the first communities of nuns in the Church of England since the Reformation. Under the patronage of the Blessed Virgin Mary the community has engaged in charitable work throughout the Anglican Communion, whilst maintaining a balance with the life of prayer. Maybe we could trade the Nuns on da Bus for 'em.